This country of 1.141 million people has been a center of controversy due mostly to the troubles between the majority Greek and minority Turkish populations, as well as Greece and Turkey's frequent interference in the island's politics. Nicosia is divided by a Green Line into northern Nicosia, the cultural center of the Turkish Cypriot community, and southern Nicosia, the official capital of the Greek Cypriot community. The Cypriot economy relies heavily on tourism, financial services, real estate, food and beverage processing, and maritime industries. GDP per capita averages about $28,000 per person according to recent estimate. Nicosia itself is the wealthiest per capita city of the Eastern Mediterranean and in 2011 was ranked the 10th richest city in the world in terms of purchasing power. Besides the abundance of financial services within the city, Nicosia relies primarily on the tourism and shipping Industries. 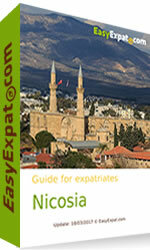 Though Nicosia is not a port (the closest port is Limassol), plenty of shipping companies have offices in the capital. You can also discuss and share experience about Cyprus in our forum.